The ultimate hand-to-hand combat book! 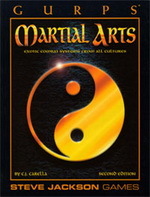 The 160-page GURPS Martial Arts Second Edition, covers over 50 different armed and unarmed fighting arts, including the historical and modern styles of both the East and the West, as well as fantasy and science fiction styles, presented in both realistic and cinematic forms. From the French fencing of swashbuckling cinema to Kendo down at the dojo, from Kung Fu at the Shaolin Temple to Savate on the piers of Marseilles, Martial Arts has it all (not to mention a convenient lie-flat binding). If you're looking for Fourth Edition mechanics, check out the newest edition of GURPS Martial Arts; it replaces and expands on the information from this book. GURPS Martial Arts – From popular Asian bare-handed techniques to European combat arts to fantastic non-human training, this Fourth Edition book balances realistic historical schools with cinematic feats from Hong Kong, Tokyo, and Hollywood.